Oh that beautiful day! The weather so cool and warm! I had barely slept the night before as I kept dreaming of my new home. Dressed in white, hands in hands with my boyfriend, we said goodbye to everyone as the whole wedding ceremony came to an end. Coming from two different backgrounds and having two different upbringings, somethings my boyfriend and I did seemed strange or rather new to either of us and off course as human as we are, resistance was inevitable. But you know what, we had our individual resolves to ensure we made our marriage work. I didn’t know he had one neither did he know I had one too. But God knew because few months into the journey of marriage, I encountered a very IMPORTANT SECRET hidden in the pages of the Bible and things changed for the best. Amongst many secrets hidden within the pages, this is one every Christian Wife needs to know. God instituted marriage when he created the woman and gave to the man. It was for companionship and fellowship. Today, many venture into it for all the wrong reasons. When I looked through the pages of the Bible, I discovered that in the New Testament God spoke to the wives first before addressing the husbands three times. (Ephesians 5:22, Colossians 3:18-19, 1 Peter 3:1-7) My dad shared with me the reason why this was so. In his words “…The reason for this can be connected to what happened in Eden because the wife was the first to take action and answer a question meant for the two of them. Who knows, if Eve had checked up from Adam before she answered the serpent’s question, there might have been a different Story.” ~ S.A Reju. Eve made a decision that changed the whole of humanity forever. As a Christian wife, I have learnt and I am still learning that personal decisions and even those that are family based MUST not be taken by me alone. I MUST get approval and agreement from my husband. In a situation where my husband has to decide on a thing, I MUST respect his decision and wisely and humbly pass across mine if I have a better one. As much as God made the man the head of the woman and the home, he made the woman a criterion in marriage provided she knows her place and understands her authority in Christ. This understanding would open doors for the Christian wife. It will influence some very crucial decisions our husbands must make as well. The Wife is described as a GOOD THING, a TREASURE and a GIFT. Understanding this my God-given position in my marriage is what keeps me on my face talking to God about my Boyfriend and Bambie. 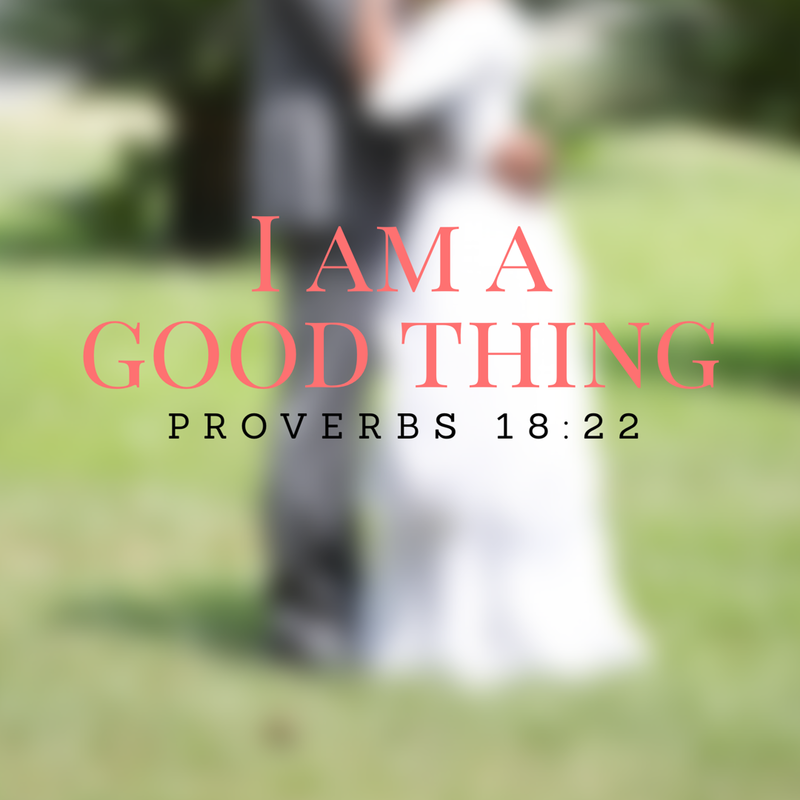 My position as a good thing, as a gift to my husband should produce the result of God’s happiness and favour. Isn’t it? Oh yes!!! Is she still Wife(not literal meaning) to you? Does she still make butterflies in your tummy? Do you still go all out to ensure she is smiling and happy? Dear wife, are you still a good thing? Does everything around you show that God is happy with your husband? Today so many people and I are beginning another year in this journey of marriage of which some have been in this a long time and some are just starting. In these years I have seen God prove himself over and over. I am known for using this phrase, “God is too faithful to fail“. Today with all boldness I reaffirm that “GOD IS TOO FAITHFUL TO FAIL!! !” I have not been the best of everything in the sense that I still get angry with my boyfriend and I still disagree with him. But in spite of my shortcomings, I have learnt and grown. I am not where I was when I said I do. The baggage of bitterness has been thrown into the sea of forgetfulness through God’s help and my Boyfriend’s encouragement. The independent strong will has been melted to prompt obedience through the help of God and my Boyfriend’s patience. I can go on and on but hey it’s not about me. It’s all about God. To every Christian couple out there, young and old, every intending couple, and singles. A marriage founded on God, nurtured by his love and fed by his wisdom is achievable. We do not necessarily need to put up pictures showing how perfect we are and all that. What we need to push out there is that “Marriage is God’s idea and a happy marriage is possible.” Don’t show the world that marriage is flawless and perfect. Don’t show the world that couples do not disagree. Don’t show the world that Couples always do things together all the time. Let the world see that our flaws don’t define our marriage, God’s grace and mercy do. Our disagreements don’t, God’s grace and mercy do. We may not always be together doing everything together, but we have a God kind of love that is not limited by distance. We are not asking for the love that is perfect to the human eye but we ask that God’s love be perfected in us which makes us love one another and our kids selflessly and unconditionally. We are not asking for the marriage or home that looks perfect to the world but we ask for a model marriage and home to our kids and the world which speaks about Jesus and Gods intention for creating marriage. We ask for wisdom and more grace to lift each other in prayer, forbear with one another and grow better in his perfect Will. Finally as i end this long writ, dear Wife, you are a good thing and I’ll share of Dad’s wisdom with you again: “You need to STUDY your husband to know what he likes or does not like and most men prefer to do things to be observed rather than to be said. Men are generally slower than women in taking some decisions (because they may want to think on the outcomes) and so you must learn to be patient with your husband instead of acting to mount pressures on some issues. There is always an opportunity to avoid mistakes and be guided by God when there is thoughtfulness before taking decisions, especially in a very critical situation.” ~ S.A. Reju. To you dear Husband, seek God, draw of his wisdom and please lead your beautiful family as the Lord leads you. Marriage is indeed beautiful by God’s grace and we look forward to many more years in this ship with God as our Captain forever. Next Day 1: What’s your Identity? Leakedfrommypen, God is indeed good. Thank you so much and God bless you without notice. I am a good thing. May your love be FOREVER. Yes you are!!! Amen! Yours too sis. God bless you and yours. Beautifully written. And fully loaded for people like us. This is my heart cry; that i be a good thing for the one God is preparing me for. At times i have this fear of “being the best for him” sometimes i’m scared of failing as a wife. but testimonies like this strengthens my faith that i would do just fine through God’s grace and mercy. By design you are a GOOD THING. Have no fear of any kind. You will do not just fine but excellently well. God bless you dear. Straight from the heart! Explicit truth relayed in plain terms! This is so insightful, thoughtful and inspiring. God bless and increase the spring of your knowledge ma’am. I’m richly blessed! May the cord that binds your union remain unsevered, may your love wax stronger each passing day and you shall celebrate more of this day in God’s glory and grace. Congratulations my Dear Sis!!! May the grace of God abide with you continually. Thank you so much Sis. I am glad and Thank God you are blessed. God bless you. Yes you are. Thank you very much. God bless you. Hi! I invite you to my blog for Christian married women. Here is my most recent article. I’ll definitely stop by. God bless you. I have been following your articles for a while now and I must confess that they are really inspiring and practical. I wish many out there would take some minutes to read through them. They are nuggets for getting it right before our spouse at the same time pleasing God. God bless u.
Hey… Thank you so much Japhet. I am so glad to read this from you. Thank God indeed. Amen. God bless you too sir.